We saw the opening ceremony for the Olympics on tv on Friday. The show was amazing. I saw so many fireworks. I remember the time we watched live fireworks on the 4th of July. I was scared of the sound so I tucked my face into Mommie's armpit. But I could not help taking peeks from time to time coz the lights they made in the sky were so pretty. On tv, the sound is not scary at all so it is much better. But the show was so long I fell asleep watching it. I am feeling all better so we went to visit Grand Grand Uncle yesterday at the nursing home. I have not been to see him in months! Mommie goes but she does not always take me. She makes sure I am in top shape before taking me there. He looks much better than before. He was riding on a motorized exercise bike when we arrived. His muscles are stiff because they are not used so the bike is going to help keep his muscles moving. He smiled at me and even imitated me by panting with his tongue out. Teehee! He waved at me, too with his pointer finger. I waved back and that made him laugh. And he was even able to say 'Hi Casper'. Eventually, he had to take a nap so we went with Grand Grand Auntie to get a bite to eat. I sat it my chair and watched the people walking by. Then we went to Mervyn's and I got to ride in the cart. It had a little seat in front for kids that was just the right size for me to sit in. It was nice and cool in there coz they had air conditioning. It was really hot outside so I was happy to ride around in the cart. After that we went back to the nursing home to give Grand Grand Uncle his snack. I was so tired that I fell asleep in Mommie's arms. So she took me home right after that. 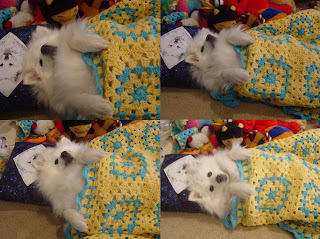 Here I am trying to get comfy to go to sleep with my colorful blanket and Eskie pillow. But it is hard when Mommie keeps taking my picture.